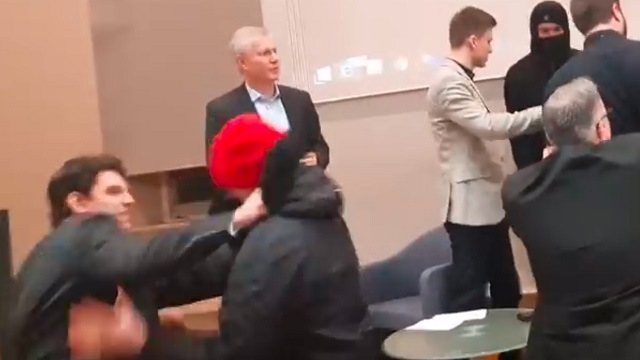 On Monday 5th March, a talk by Carl Benjamin (Sargon of Akkad) was shut down at King’s College London (KCL). We protested this event — organised by the KCL Libertarian Society — in line with the right to protest enshrined in our SU policy. Benjamin’s speech was later stopped by Antifa, independently from our counter-demonstration. The events of this evening show both the complexity and urgency of the present moment on university campuses. It is also a clear indication of KCL’s failure to protect marginalised students while instrumentalizing and manipulating the ‘freedom of speech’ narrative to give platforms to alt-right speakers. Not surprisingly, liberal and right-wing media outlets have focused on the violence that broke out — victimising and threatening students who were present — while King’s management has handed the matter to the police, calling for “the most stringent measures”. But then we ask: if our university is so quick to condemn violence, why are they paying host to a Nazi,Gabor Vona, the notorious fascist leader of Hungary’s Jobbik, later this month? An event initially scheduled for tomorrow and postponed after the incident on Monday? If our principal, Edward Byrne, was so “shocked” about a smoke bomb being used on Monday, how is he not shocked about giving a platform to a man who admires the Hungarian fascists who helped send 475,000 Hungarian Jews to their deaths in the Holocaust? We protested Benjamin’s event because he is known for advocating violence. He incites cyberbullying, racism, misogyny, Islamophobia, and anti-semitism. He has also been promoting the alt-right, having invited figures such as Millennial Woes (a Scottish white supremacist alt-right YouTuber) onto a live-stream. In the past, Benjamin has been endorsed by the reactionary neo-Nazi blog, MoreRight, the English Defense League, and far-right news site Breitbart News. Furthermore, Benjamin was present amongst the alt-right supporters of Milo Yiannopoulos when the latter recently spoke at an event at the University of California – Berkeley. Right Wing Watch states how Benjamin “has exposed his regular audience of hundreds of thousands of viewers to white nationalists and their hateful ideologies. In a livestream with alt-righter Colin Robertson, Benjamin peddled the alt-right conspiracy theory that Charlottesville victim Heather Heyer died because of a heart attack, and not because she was run over by a white supremacist, thus being a terrorist apologist. Those who still claim that he’s a classical liberal should reflect on the fact the co-leader of Generation Identity Austria, Martin Sellner, when expressing concern over right-wingers being “silenced”, gave Benjamin as an example for being shut down at King’s? The safety of marginalised students must be a priority, not an afterthought. While the university has taken care to ensure that speakers like Benjamin are guaranteed their right to freedom of speech, by refusing to erase the harmful messaging, it has failed to consider that it has a duty to protect its students (particularly from minority backgrounds) from racism and hate speech. We must not forget that during Trump’s election, some students at King’s were seen waving Confederate flags and making hateful comments — we reported this and sent evidence but were ignored by both KCLSU and KCL without any investigation. Here we can see King’s everyday, institutionalised hypocrisy play out: war criminals and members of the alt-right are allowed onto campus, with no issue, whilst marginalised and international students on campus are surveilled through the Prevent programme, as well as border control and border surveillance both inside and outside the classroom. The role of the university is inseparable from these material conditions. It is crucial to challenge this systemic, inherently violent bigotry, in whatever form it takes. We demand that KCLSU and KCL do not provide spaces, platforms or resources for the alt-right. We will never allow their speech to be normalised. Let it be clear that we will always oppose the organising of alt-right spaces (such as the one on Monday night, where Benjamin used the framework of public/free speech in order to advance his political goals). This is not a question of free speech — but a question of whether or not we will allow the alt-right to organise on our campuses to implement their programme. We say no. Although Gabor Vona’s event was postponed due to pressure from the community, we demand a full cancellation, no platforms for fascists and a public apology from our Vice Chancellor Edward Byrne for even considering him as a speaker on our campus. We urge every student and outside supporter to keep our university accountable. King’s College will not provide a safe environment for its marginalised members, this will only be possible through collective direct action and the power of solidarity across communities. There is no place for fascists, whether on our campus or beyond it. Anti-Racism Network (KCL)is a network of societies at King's College London fighting racism on campus. I feel compelled to respond to some inaccuracies in this article. First of all this whole article is a misdirection. Sure, Gabor Vona, that’s a fair point to discuss, but this is the direct aftermath of violence and property damage at kings. You do not get a free pass because something else may or may not be wrong at the university. In addition this comment “We protested Benjamin’s event because he is known for advocating violence.” links to an article that provides no evidence whatsoever that Benjamin is advocating violence. The article, in fact, talks about Benjamin suggesting that Heather Heyer died of a heart attack and not from the car crash in Charlottesville. Your article also mentions this, but you fail to mention that when he was confronted about this later, he accepted that he was wrong. Safety of students should absolutely be a priority at Kings College, which is what your organisation put in jeopardy. I would have liked to see this event, not because I agree with the speakers, but precisely because I do not. You have not provided any evidence of how his presence put people in danger. Instead, your actions have put students and staff at KCL in danger. 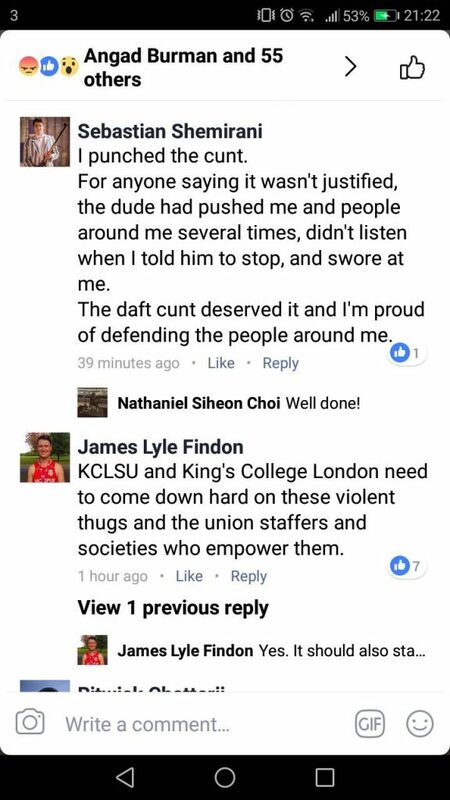 It is rich that you claim to stand for safety at KCL while accusing Benjamin of advocating violence when he explicitly states that he does not unless in self-defence. You, on the other hand, have facilitated violence at KCL, you have failed to condemn it, and you have falsely accused others of perpetuating violence. You also fail to disclose that people had to go to the hospital due to this event, and the only video of the event you show in this article as an example of violence is a student angrily slapping something that can not be seen on screen. This whole article is misleading and misinformed. If you are unable to condemn actual assault of KCL staff and students because individuals who share your ideology committed it, you are frankly no better than what you accused these speakers off.